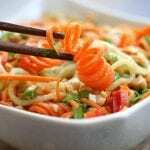 Process carrots, cucumbers and red bell peppers by either julienning or spiralizing and place in large mixing bowl. Add chopped green onions, cilantro and peanuts. In a smaller mixing bowl whisk together all ingredients for dressing. Pour dressing over veggies and toss well. *Please use as many organic ingredients as possible. * Ginger is an affiliate link.